Print History: Then and Now. 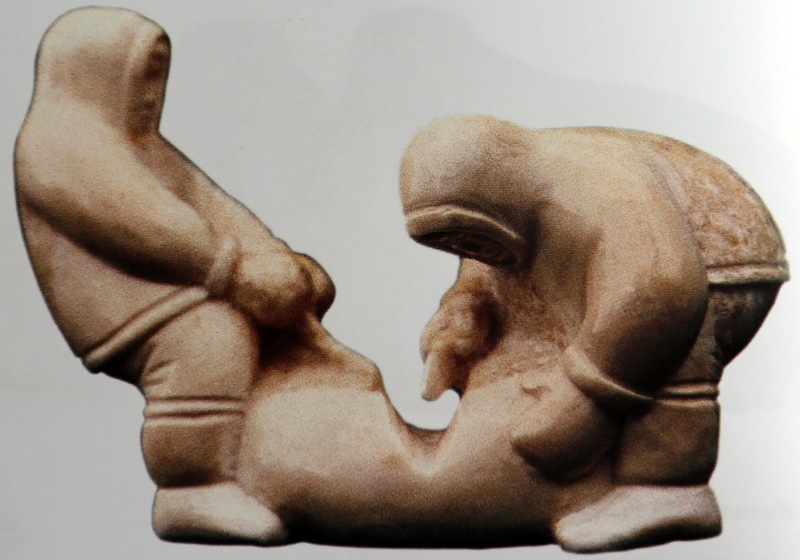 This collection of photos came from a book called "Bone Carving in Uelen. The folk art of the Chukchi Peninsula." Published in Moscow in 2002. The following is a comparison of ancient stories told through ivory and their counterparts told through printmaking. Anatoly Tymnetagin. "Fairy-tale Bear Wife." Walrus Ivory, 1970s. Luba Eynes. Legend of the Hunter and the Polar Bear." Etching. 2004. Elena Yanku. "Fairy-tale Seal Woman." Engraved Walrus Tusk. 1970s. Luba Eynes. "Legend of the Woman Seal." Etching. 2004. Artist Unknown. "Polar Bear Attacking Walrus." Walrus Ivory. Late 19th Century. Stanislav Il'Key. "Polar Bear Attacking Walrus." Etching. 2004. Nicolay Kililoy. "Walruses." Walrus Ivory. 1950s. Andrey Ettyntegrey. 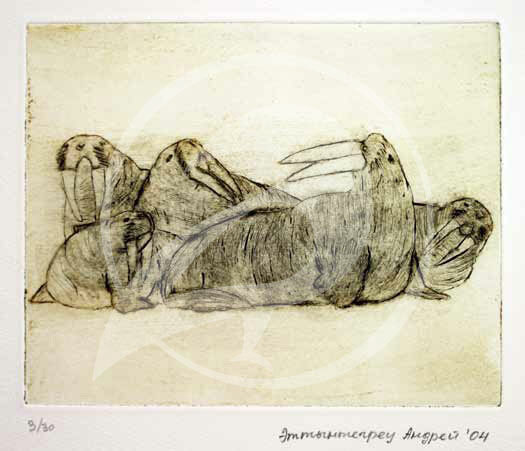 "Walruses." Etching. 2004. Galina Tynatval. "Fairy-tale Ravens and Foxes." Engraved Tusk. 1970s. Marina Ergiro. "Legend of the Sly Raven." Etching. 2004. Anatoly Tymnetagin. "Carving Blubber." Walrus Ivory. 1972. Luba Eynes. "Butchering the Walrus." Etching. 2004. Elena Yanku. "Out in the Tundra." Engraved Walrus Tusk. 1970. Sergey Il'key. "Reindeer Herders." Etching. 2004.